Analysis of the recent proposed SARFAESI amendments : are these consistent with the Insolvency and Bankruptcy Code? by Rajeswari Sengupta and Richa Roy. The Insolvency and Bankruptcy Code (IBC, 2016) recently passed in both Houses of the Parliament is a significant step towards improving the bankruptcy resolution framework in India. Among other things, the IBC seeks to replace all existing laws related to bankruptcy resolution. This constitutes a significant departure from the present system that is characterised by multiple laws and forums as well as an inherent bias towards secured financial creditors. The existing laws such as SARFAESI, 2002 and the RDDBFI, 1993 (that set up the Debt Recovery Tribunals or DRTs) Acts are designed to exclusively benefit secured creditors such as banks and financial institutions while limited legal recourse is available to other unsecured creditors and operational creditors in the event of insolvency of the debtor firm. The IBC seeks to resolve this issue by according rights to all types of creditors, and not just secured financial creditors, to trigger insolvency proceedings against the debtor firm. However the IBC by itself cannot achieve better bankruptcy resolution outcomes, and needs to also be supported with related laws and regulations. Earlier this month the Enforcement of Security Interest and Recovery of Debts Laws and Miscellaneous Provisions (Amendment) Bill, 2016 was tabled in the Parliament. This bill proposes amendments to the SARFAESI Act of 2002 and has been referred to the same Joint Parliamentary Committee that reviewed the IBC. The underlying objective is that along with IBC, an amended SARFAESI Act will help expedite the debt recovery process in India. While there is an inherent tension between laws for security enforcement and those for insolvency or bankruptcy resolution, these two actions must work in harmony in order to be successful. Our analysis suggests that the proposed amendments to the SARFAESI Act need to be modified in order to be consistent with the IBC. In addition, there are certain provisions in the IBC itself relating to security enforcement that need to be sharpened to improve the efficacy of the IBC as well as individual security enforcement. The review by the same JPC that reviewed the IBC offers an opportunity to do this. In the existing legal regime in India, there are multiple debt recovery and security enforcement laws (SARFAESI being an example) which create opportunity for individual recovery action, as opposed to an insolvency law that deals with collective action. The former is about enforcing a specific contract or foreclosing one or more specific security interest(s). Insolvency law on the other hand deals with collective assessment of viability of the debtor's business as a going concern. If the business is found to be viable, resolution involves restructuring of the firm and its business and/or its debts. If the business is found to be unviable, then the firm is liquidated and secured financial creditors are given the right to enforce their security if they so choose. It is critical that during an insolvency resolution process, the rights of debt recovery and enforcement of security interest be suspended as that is the only way in which creditors can be made to adopt collective action. If the secured financial creditors are given the right to enforce while an insolvency resolution is in progress, it is highly likely that they will choose individual enforcement action which may undermine the overall resolution process, thereby hurting the interests of the other creditors. This is what is happening currently in India as maybe evidenced by the fact that banks rely mostly on SARFAESI and DRTs rather than creditor arrangements. (While they do undertake some forms of non collective out-of-court mechanisms such as CDR and JLF, arguably this is to get provisioning benefits. Also these measures distort the incentives in the credit process and skew the same towards large debtors and creditors). This issue is even more important in India given that secured credit from banks and financial institutions continues to be the dominant source of debt financing for companies. For instance in 2012-13, out of all the sources of funds for non-financial firms in India, borrowing amounted to 21.57% out of which bank credit alone was 15.20%. Multiple actions by various classes of creditors also leads to confusion and forum shopping. SARFAESI Act, 2002 provides a safety net to secured financial creditors (banks and financial institutions) by empowering them to enforce their security interests without the intervention of any court. On the other hand, under IBC, the rights and interests of all types of creditors have been taken into consideration including that of secured creditors. The natural question that arises now is how will these two parallel legal processes coexist. More specifically, how will the rights of secured creditors be governed in presence of both these laws and whether, going forward, there may be any ground for conflict in the interaction between these two laws. While taking away the rights of secured creditors to enforce security as vested in them by SARFAESI may not thus be a viable option at present, without the IBC having proven its success, it is critical that the provisions of SARFAESI are dovetailed with IBC, such that the former Act does not undermine the effectiveness of the latter. The IBC as passed in the Parliament contains provisions that explicitly refer to the rights of secured creditors under SARFAESI. Section 14(1)(c) of the IBC provides that the moratorium would apply to : "any action to foreclose, recover or enforce any security interest created by the corporate debtor in respect of its property including any action under the Securitisation and Reconstruction of Financial Assets and Enforcement of Security Interest Act, 2002." Accordingly this moratorium applies to all acts by any kind of creditor under SARFAESI. Also, Schedule 7 of the IBC amends SARFAESI to subject all collective action under SARFAESI to the provisions of the IBC. Given that these provisions are already incorporated in the IBC, now the SARFAESI Act also needs to be amended accordingly such that provisions of both these laws are in sync with each other and there is no confusion about applicability of the laws to the specific economic actors at specific stages of the insolvency resolution process. The proposed changes in the amendment bill with regard to the SARFAESI Act significantly enhance the rights of the asset reconstruction companies (ARCs) in the acquisition of assets of the debtor, include the debenture trustee as a secured creditor, widen the scope of powers of the RBI in regulating ARCs and extend the scope of the Central Registry (CERSAI) created under the Act. According debenture trustees the same rights as other secured creditors (banks and financial institutions) is a useful step and is in line with the IBC's aim of creating a level playing field for all lenders. So also is significantly expanding the scope of the information available in the CERSAI. Similarly, permitting banks and financial institutions to transfer financial assets to ARCs prior to them being declared as non performing assets (90 days post a payment default) is also in line with the IBC's aim at early detection and resolution of distress. While these amendments are in line with the spirit of IBC, it is now necessary to further clarify how these additional changes will dovetail into IBC and this is what the JPC should consider in its review. First, the SARFAESI should include the manner in which each action thereunder can be taken in reference to resolution and liquidation under the IBC. For instance, it should be specified that any action under Section 13 of the amendment bill, by a bank or a financial institutions or under the new Section 9 by ARCs will be subject to the moratorium under Section 14 of the IBC. It could further be clarified that the transfer of a financial asset from a bank or financial institution to an ARC during the moratorium under IBC would be permitted. Indeed, under IBC one would expect several secondary transfers of debt to occur during the insolvency resolution process (IRP) for creditors to be able to influence voting in the creditors' committee. Following the 180 day period of IRP in the IBC there are two possibilities: (a) a resolution plan; or (b) liquidation. The SARFAESI amendments need to clarify that any enforcement action following the moratorium should be compliant with the IBC resolution plan that has been voted on by majority of creditors. In liquidation under IBCa, all secured creditors have the right to stand outside the proceedings and enforce their security using SARFAESI or otherwise. The SARFAESI amendments could clarify this as well and also the manner in which this would occur for instance mandating the secured creditors to inform the liquidator and pay their portion of the liquidation costs. Secondly an important feature of IBC is a mandatory moratorium during the IRP in order to stay all creditor action. The moratorium applies to the enforcement of security interests under the SARFAESI as well. However under the IBC as passed in the Parliament, the Central Government reserves the right to provide exemptions to specific transactions in consultation with a financial sector regulator. It is not clear why this exemption is needed and how wide its scope can be. Does it mean this provision can be used to exempt secured creditors such as banks and financial institutions from enforcing their collateral during the moratorium? As a corollary, does this mean using this exemption, banks can invoke the SARFAESI Act to enforce their security even as an IRP is in progress triggered by another creditor? This could be dangerous and would defeat the purpose of the moratorium, not to mention strip the IBC of its very essence. The amendments to the SARFAESI Act do not provide any clarity on how such interactions between the two laws will be dealt with. This power of the central government should either be removed or the precise basis on which this power will be exercised should be tightly set out in the amendment Act. Since debt recovery action and insolvency resolution can be at loggerheads with each other for reasons described above, amendment to SARFAESI can specifically provide that individual debt recovery action would not be exempted under this provision. The central government should potentially exercise this right of exemption only for attachment of assets by enforcement authorities in the respect of financial crimes. Alternatively IBC needs to be amended or specific rules need to be written now, clarifying the reach of this provision. Third, under the IBC, all corporate insolvency resolution cases will be adjudicated upon by the NCLT whereas all individual insolvency resolution cases will be dealt with by the DRTs. Even after the amendments, all SARFAESI cases will continue to be referred to DRTs as is the practice now. DRTs are overburdened with cases and highly capacity constrained. The amendment bill itself mentions that approximately 70,000 cases are pending at DRTs for many years due to adjournments and prolonged hearings. Given this state of affairs, perhaps the corporate recovery cases under SARFAESI could be shifted to the newly constituted NCLT, in sync with the IBC. Given that NCLT itself will handle the IBC cases, existing winding up cases as well as adjudicate upon matters related to company law, perhaps only SARFAESI related appeals can be referred to the NCLT, to reduce the burden on DRTs. This presumes that NCLT will use new ideas in how to organise courts, without which it will rapidly collapse with a huge backlog of cases. Fourth, in the IBC framework of `information utilities' (IU), there would be a private competitive industry of IUs. This is inconsistent with a single statutory CERSAI which is a monopoly. In summary the following corrections maybe proposed to the SARFAESI amendments: (i) Remove all kinds of SARFAESI enforcements from the exemption provision of the moratorium under IBC that the central government can grant (ii) Provide greater clarity regarding interaction of the provisions of SARFAESI to IBC (iii) Refer SARFAESI related appeals to NCLT, (iv) Locate CERSAI in the IBC concept of information utilities. A primary intent of the IBC is to have a unified, consolidated law that applies to all economic actors. Effective implementation of IBC is now of utmost importance in order to achieve the goal of a simpler and faster resolution mechanism that produces a higher recovery rate. Lack of sufficient clarity in the proposed amendments to the SARFAESI Act will create uncertainty about the rights of secured creditors and dilute the working of the IBC in practice. The existence of dual laws (IBC and SARFAESI) and forums (NCLT and DRTs) to deal with the debt recovery problems of secured creditors will result in more time being spent in resolving confusion and create opportunity for litigation, the very problem that the IBC is aimed at resolving. This uncertainty needs to be addressed by the JPC reviewing the amendments. Richa Roy is a lawyer and public policy analyst at AZB Partners. Rajeswari Sengupta is an academic at IGIDR, Bombay. Both were part of the drafting team for the Insolvency and Bankruptcy Code. The authors thank Bhargavi Zaveri for useful discussions. In India, we all seem to agree that we have a dysfunctional criminal justice system. This, has however, not yet translated into large scale attempt at reform. Perhaps the reason for the inaction is our inability to quantify the nature and extent of the problem. For example, we don't really have good quality data on crime or actions by the police . We don't have good quality data on the extent and causes of delays in our courts. Our court systems inhibit measurement. Since we don't have this data, we cannot estimate the cost of badly run police and courts on the economy, and on the satisfaction of our citizens. Evidence has not been marshaled in a systematic way about the extent and nature of under-performance. What gets measured, gets managed. This post describes two new survey based initiatives on measuring the problems in our criminal justice system. Did the households report this to the police? Did the police respond appropriately? If the households chose to not report to the police, what were their reasons? Do households feel safe in their neighbourhoods? Or in public transport? At different times of the day? The survey has given some important new facts. A full 13% of households in Delhi and 15% in Mumbai report being victims of one of the crimes, with theft being the most commonly experienced crime. Reporting of crime is low in both cities, at less than 50%. The lowest reporting percentage is for sexual harassment - only 11.1% cases were reported in Mumbai, and 7.5% in Delhi. In both cities, the reporting was on the passing of lewd or unwelcome sexual comments. Incidents of groping were not reported. The most important reason for non-reporting was that people just didn't want to get caught up in police or court matters. Not having enough evidence was cited as the second reason for not going forward with the reporting. Households felt that the police would just not be able to do anything about their complaint. The anticipation of households is perhaps not misplaced, for less than half of the cases reported to the police by the respondents had an FIR registered. This is particularly the case for sexual harassment cases. None of the cases reported in Delhi and 40% of cases in Mumbai led to an FIR filing. Similarly, none of the missing persons complaints in Mumbai lead to a FIR registration. Low initial reporting by households, and low registration of FIRs by the police implies that official crime statistics perhaps only report one-quarter of the crime experienced. This under-reporting gap is significant. Of those households who reported crime, roughly 36% in Delhi and 51% in Mumbai said they were satisfied with the first police response. The largest satisfaction is with the police response on assault cases, both in Delhi and Mumbai. The lowest satisfaction is on police response on house break-in (in Mumbai), and on sexual-harassment (in Delhi). It is likely that the record of the police on investigations and actual completion of a case is even lower. Households in Delhi begin feeling unsafe, even in their own neighbourhoods, earlier in the evening than those in Mumbai. People's fear of crime is correlated with what is experienced in their neighbourhoods. The crime people are most fearful of is theft in both cities. Households in Delhi are more fearful of sexual harassment, while in Mumbai are fearful of assault. Residents of Mumbai generally perceived the police in a more positive light, and felt safer than those in Delhi. Who is accessing the judicial system? This includes information on the socio-economic profile of citizens who seek remedy from courts. What are litigants using the judicial system for? What is the subject matter of the civil cases? What is the litigants perception of delay in courts? Why do the litigants think the delay occurs? What is the cost to litigants of access courts? The survey finds that 84.3% of the litigants were male. Women accounted for only 15% of the litigants, suggesting that women in India don't really access courts. 80% were Hindus, with 45% belonging to the "General" caste category. Most cases are between people of the same religion, that is, 74% of the cases by Hindu survey respondents are against other Hindu respondents, 43% of the cases by Muslim respondents and 75% cases by Christian respondents are against members of their own religious communities. This is similar across caste as well. 15.6% of all litigants had traveled between 50 km and 300 km to reach the courts for hearings. Those engaged in agriculture accounted for 38% of the litigants, followed by those in private service at 24%. What is interesting is that a large majority of these litigants (almost 80%) are in the less than Rs.3 lakh annual income category. Almost 50% of the litigants have only studied till Class XII. This suggests that it is the low-income individuals that are choosing to access courts. Land and property matters dominate civil litigation across the country, followed by litigation on family matters. This correlates with those in agriculture being the largest category of litigants, and with cases being fought against members of one's own religious communities. The survey finds that 10% of accused were handcuffed within the court premises. This goes against Supreme court guidelines that guarantee a minimum freedom of movement. Only 63.5% of the accused who were granted bail were in jail in less than one month - this means that almost 40% of accused who were granted bail, had to stay in jail for longer than a month. The surveyed litigants felt that the two causes of delay were the inability of judges to pass orders quickly, and the non-appearance of opposite parties on the dates fixed for trial. This is costly -- civil litigants spend Rs.497 per day on average for court hearings. They incur a loss of Rs.844 per day due to loss of pay. Criminal litigants spend Rs.542 per day for court hearings on average and incurred a cost of Rs.902 per day due to loss of pay. Their analysis indicates that log-jammed courts are wiping almost 0.5% off India's GDP, and this is likely to be an underestimate because it doesn't measure the cost of cases that never even came to courts. Core public goods like safety are the responsibility of the government. In India, substantial outlays on the criminal justice system are being made, but there is no measurement of the outcome. We are at the early stages of figuring out how to reform courts [link, link] and more generally the criminal justice system. Surveys such as those above are the one of the first few attempts at building a systematic database about the outcomes obtained in the field of the police and courts. This can shape policy thinking in the future, about reforms of the existing criminal justice system, and about the resourcing of this core public good. Unnecessary adjournments delay debt recovery proceedings: report by Shreeja Sen in the Mint, 25 May. Real estate-need, aspiration or megalomania? by Abaneeta Chakraborty in Forbes India magazine, 25 May. Somasekhar Sundaresan on the Supreme Court ruling on the regulation-making process in the context of the TRAI calls dropped order, in the Business Standard, 24 May. A Severed Head, Two cops, and the Radical Future of Interrogation by Robert Kolker in Wired magazine, 24 May. India Inc's distress sale misses its mark by Ishan Bakshi and Sudipto Dey in the Business Standard, 23 May. Competition, Regulation and Growth in New Delhi: Annual Day Lecture by Arun Jaitley at Competition Commission of India, 20 May. Beyond the FIPB by Bhupesh Bhandari in the Business Standard, 19 May. Government and RBI have left tax payers with a big bill by Sanjiv Shankaran on The Times of India, 19 May. Chromebooks outsold Macs for the first time in the US by Tom Warren in Verge, 19 May. This is how fascism comes to America by Robert Kagan in the Washington Post, 18 May. Going dark: online privacy and anonymity for normal people on Troy Hunt's blog, 17 May. Girls from progressive societies do better at math, study finds, on Science codex, 16 may. How factory farms play chicken with antibiotics by Tom Philpott in Mother Jones, May 2016. Video from the NIPFP youtube channel: Enabling a national market in agriculture: Components of a national market and related legal issues by Devesh Roy at NIPFP, 3 May. India set up a depository system in the 1990s to deal with the problem of physical share certificates, reduce settlement time and increase the efficiency of the securities markets. Instead of establishing an electronic depository, imagine if the Government had appointed an authority for deciding whether the seller has title to a security every time a transfer takes place, for a fee. This would have led to numerous problems. It would have increased transaction costs and settlement time for securities transactions. The sanctity of title to securities would have depended on the adjudication capacity of the State. The cost of maintaining adjudication machinery would have been borne by the parties, or worse, by the State. The Government sought to resolve this problem by providing for infrastructure in the form of depositories, which are a near-foolproof method of obtaining title to shares. In an earlier post, we explored what the Indian land market could learn from the securities market. The problem of incomplete land records in India is similar to the problem of physical share certificates, only compounded by the complexity of multiple offices across which land records are kept. The Rajasthan Assembly recently passed the Rajasthan Urban Land (Certification of Titles) Act, 2016 (Rajasthan Titling Act), which purports to be a shift from the presumptive titling system to the conclusive titling system for recording land titles. Popular discourse has praised this law as a big step toward a rules-based regime for land titling (see here and here). In this article, we explain (a) why India needs to be more circumspect about adopting conclusive titling as its solution to the problem of incomplete land records; and (b) why the Rajasthan Titling Law, in its current form, is not a shift to conclusive titling. The State registers and guarantees the title to land. If a person claims and proves that she had a better interest in the land than the title-holder registered with the State, such person is insured by the State. The titleholder registered with the State cannot be dispossessed. Variations of this system are followed in Australia, Canada and the United Kingdom. The State registers the deed under which a person obtains title to land. The State does not make any enquiry as to the legitimacy of the claim made under the document. If there is a dispute, the deed registered with the State is only presumptive evidence. It can be defeated by someone proving better title. The United States (with the exception of few a counties spread across five States), India and France follow this system of recording land titles. The State does not insure title, a private industry does that job. In countries following conclusive titling, the title registered with the State is conclusive subject to several caveats. For instance, the State's records do not take notice of (a) government interests such as claims on account of tax dues; (b) possessory interests such as short term leases and easements and long term interests such as those acquired by adverse possession; (c) disrepancies due to fraud; and (d) local municipal claims such as setback areas for road-widening, etc. Hence, a prudent purchaser of land will, in any event, conduct a search exercise to ensure that she will be able to enjoy the land uninterruptedly. A private title insurance industry co-exists in countries where the State insures title. While the State only insures against defects arising due to the conduct of the State registry, private insurers typically also insure against claims not on the State's records, litigation costs, etc. This indicates that in countries where private title insurance is customary, State-insurance of title does not eliminate transaction costs associated with private title insurance. It requires the existence of a fully functional adjudication system at the level of each Tehsil (sub-district), to ensure that landholders have access to get their title registered by the State. Depending on the location, a land parcel in India may have gone through innumerable transactions and the adjudicator will require to verify the legality of each of those transactions. Adjudication is expensive, implying that people having better resources to get their title adjudicated by the State, will end up having better "title" to land. The State Government will appoint an IAS officer who will adjudicate title to urban land. A person who holds title to a parcel of urban land may apply to the IAS officer for a title certificate confirming her title to the parcel. The applicant must pay a certification charge, which is a percentage of the circle rate prevailing in that area. The IAS officer must not issue the title certificate if (a) there are unpaid tax dues; or (b) where the title is disputed, whether before a Court or otherwise. Where a person enters into an agreement with the owner of the land on the basis of the title certificate and later finds that there was a defect in the title of the certificate-holder, the State Government will compensate such person for any loss that she may suffer due to any title defect (except one that is recorded in the certificate). The law proposes to set up land-tribunals for entertaining appeals against orders of the certification authority. The Rajasthan Titling Law, though well-intended, will not resolve the problem of information asymmetry or transaction costs that burden land transactions today. It is silent on whether the certificate will reflect encumbrances or interests such as grant of development rights or power of attorneys to sell, which are some common methods of alienating control over land in India today. A large part of the land-related diligence in India pertains to the nature of the land (as opposed to the right of the seller), due to the multiple restrictions on marketability of different kinds of land. For example, if the land is agricultural, it cannot be sold to a non-agriculturist, or if the land is held in excess of the ceiling limits, it is susceptible to forfeiture by the State. The certificate issued under the Rajasthan Titling Law will not record the nature of the land. It will similarly not record the State's claims such as reservations under municipal laws for road-widening, etc. This means that purchasers of land will require to conduct their own diligence, despite the certificate. The law allows the adjudicating officer to cancel the certificate if it is found to have been issued under mistake. This means that the certificate is not indefeasible and the purchaser will require to conduct an independent enquiry of the seller's title. Effectively, the title certificate will be no better than a Record of Rights (ROR) which has some presumptive value. It is also not clear what happens to third party rights created by the holder of a title certificate issued under mistake. The law does not state that the title recorded by the State is conclusive and the person registered as the owner cannot be dispossessed. It merely insures persons who enter into any transaction on the basis of the title certificate issued by the State. Thus, the law does not pre-empt title-related litigation between the registered title-holder and a person claiming better title. Finally, the law does not clarify the process for claiming insurance from the State for faulty certificates. Claiming such insurance from the State will, in itself, involve transaction costs. Initial registration of title with the State is like adjudication of the applicant's title, as the registration process has involves determining the rights of parties to a land parcel. The registration will require the IAS officer to apply laws ranging from property law, contract law to hindu law. For example, where an applicant has obtained her title under a partition arrangement, the officer will require to dive into the legality and enforceability of the partition agreement, to adjudicate title. This will entirely depend on State capacity. A mistake in this process is a potential dent in the State's insurance fund. Dependence on the State for proving one's title creates tremendous scope for rent seeking and corruption which is already widely prevalent in the area of maintenance of land records. The insurance fund for compensating those who suffer a loss by relying on the State-issued title certificates. (See McCormack 1992, noting that the entire assurance fund set up by the State of California was wiped out by one claim, which prompted the repeal of the California Torrens Act, the law which provided for conclusive titling in California). Finally, there is no clarity on the process for deciding on insurance claims from the State for faulty title certificates. What is the right intervention? Consolidation of land records maintained across several offices: For example, consolidating the offices of the Sub-Registrar (where land transaction documents are registered) and revenue authorities (where the State records title for the purpose of collecting land revenue). Digitalisation of (i) land records; (ii) the process of recording interests in land; and (iii) the process of accessing land records. Several States have initiated some of these steps and are at different stages of their implementation. Project Bhoomi undertaken by Karnataka and e-dhara undertaken by Gujarat are examples. The Digital Land Records Modernisation Program of the Central Government, which has been underway for sometime, is also meant to incentivise States to digitalise land records and consolidate the land record offices. Fixing infrastructure is a much more difficult solution than enacting a law to fix the problem. It requires tremendous political will, sustained efforts through political cycles and strong ground level teams. However, the implementation of the Aadhar project has shown that dedicated implementation-level teams can achieve what a law, by itself, cannot. John L. McCormack, Land Title Assurance in the Computer Age, William Mitchell Law Review (1992). Jonathan Zasloff, India's Land Title Crisis: The Unanswered Questions, Jindal Global Law Review, Vol. 3, 2011. Bhargavi Zaveri is a researcher at the National Institute for Public Finance and Policy. She thanks Shefali Malhotra and Anirudh Burman for useful discussions. Note: The 2017 state of the art is out. Bankruptcy reforms have been moving forward at a blistering pace for the last few weeks, with the Insolvency and Bankruptcy Code ("IBC") being enacted by the Lok Sabha and then the Rajya Sabha. In this article, we take a look at where we are in Indian bankruptcy reform, and where we need to go next. All business plans are speculative views of the future. Some will inevitably go wrong, either because of failures of conception or of execution. As India lacks the requisite institutional arrangements, at present, when a firm goes into default, the management, capital and labour get stuck in an interminable mess. With a sound bankruptcy process, we would be able to rapidly resolve the situation, and everyone would move on. This is the best outcome for society at large. In such a world, there would be more entrepreneurship, more risk taking, more debt, more unsecured debt, and more non-bank debt. In India, the lack of a sound bankruptcy process implies a flawed legal foundation of limited liability companies. The classic definition of limited liability is a bargain: Equity is in charge of the company as long as all dues to Debt are met. When the firm defaults on its debt obligations, control over the assets of the firm shifts from Equity to Debt. This is not how India understands limited liability today. We tend to think that a company belongs to its founding family no matter what happens by way of firm default. As a financial agency with a keen interest in good bankruptcy outcomes for banks, RBI has led many attempts at bankruptcy reform. These include CDR, SDR, wilful defaulters, and ARCs. However, these have not delivered results. Even if these policy initiatives had been better designed, the role of RBI in the credit market is inherently limited because there is much more to lending than lending by banks. The bankruptcy process requires a machinery that is grounded in Parliamentary law, which is beyond the powers of regulations or informal arrangements made by a financial agency. One component needed for bankruptcy reforms was built by the Financial Sector Legislative Reforms Commission (FSLRC), led by Justice Srikrishna from 2011 to 2013. The `resolution corporation' in the draft `Indian Financial Code' (version 1.0 in 2013 and then version 1.1 in 2015) is a specialised bankruptcy process for two kinds of financial firms: those that make intense promises to consumers, and those that are systemically important. This component has been slowly moving towards implementation, after MOF first setup a `Task Force' on the subject, and then made an announcement in Para 90(i) of the budget speech of February 2016. But the bankruptcy process for all other firms was a project waiting to be done. Some work on these lines went into the Companies Act, 2013, but it only partly dealt with the mechanisms of restructuring and winding up. Entrepreneur friendly legal bankruptcy (sic) framework will also be developed for SMEs to enable easy exit. This sentence could have been done in an incremental way. Instead, it was taken on a more ambitious scale at the Ministry of Finance (MOF) with a policy project that would go beyond just an SME bankruptcy framework for India. In late 2014, MOF setup the Bankruptcy Legislative Reforms Committee or the BLRC, led by Dr. T. K. Viswanathan, with the objective of building a full fledged bankruptcy code. The work of the BLRC was placed in the FSLRC division of the Department of Economic Affairs (DEA), so as to harness the institutional memory about the working of FSLRC. The BLRC submitted a two volume report on 4 November 2015. The report is similar to the output of the FSLRC: the economic rationale and design features of a new legislative framework to resolve insolvency and bankruptcy was in Volume 1 and the draft bill was in Volume 2. These materials were put on the MOF website. A modified version of this bill, with public comments incorporated, was tabled in Parliament in the winter session on 23 December 2015. After the IBC was tabled, the Joint Parliamentary Committee on Insolvency and Bankruptcy Code, 2015 (JPC) was set up on the same day to analyse the draft bill in detail. The JPC submitted its report which included a new draft of the law. This is the draft Insolvency and Bankruptcy Code (IBC) that has since been passed by both houses of Parliament. The essence of the BLRC proposal is a formal procedure, termed the `insolvency resolution process' (IRP) which starts when a firm or an individual defaults on any credit contract. Any creditor is empowered to initiate an IRP: a financial firm or an operational creditor whether it is a non-financial firm or an employee. An insolvency professional (IP) called the `resolution professional' (RP) manages the working of the IRP, and is responsible for compliance with the law. Once the IRP commences, power shifts from shareholders/managers to the Committee of Creditors. This includes the power to take over management of the firm, the ability to change management, to bring in fresh financing, to ask for all information required in order to invite bids for commercial contracts, including from the existing creditors and debtor, to keep the enterprise going. Decisions are made by voting in the Committee of Creditors. For firms who have significant organisational capital, the value of the firm as a going concern in the eyes of a buyer would exceed the liquidation value of the assets of the firm. Such firms are likely to attract bids where the value of the firm is more than the value of its physical building blocks. However, organisational capital rapidly depreciates. Hence, it is critical for the IRP to begin quickly and move forward quickly, aiming to get closure while the firm is still a going concern, so as to avoid value destruction with the firm becoming defunct. Speedy resolution is incentivised in the IBC by having a time limit of 180 days for the IRP. If, in 180 days, 75% votes in the Committee of Creditors do not favour one resolution plan, the debtor is declared bankrupt. The IBC then provides clarity about which assets are available for liquidation, and a clear prioritisation of who has rights to these assets for recovery, in liquidation. In general, the recovery rate for creditors is lower when a firm goes into liquidation. This creates incentives for the creditors to be rational about their activities in the critical 180 days. The process of resolving insolvency is similar for firms and for individuals. In the case of individuals, however, the final resolution plan must have the consent of the debtor. There are additional innovations in the process of individual insolvency in the IBC that will increase individual default resolution efficiency in India. One is the concept of the Fresh Start, which gives a debt write-off for individuals who are below certain thresholds of wealth and income at the time of default. Another innovation concerns an individual who has offered personal guarantees to support firm loans. When the firm default triggers these guarantees, it is likely to stress the personal guarantor to default and trigger individual IRP. Under the IBC, ordinarily, this individual insolvency case is heard at a Debt Recovery Tribunal (DRT). S.60 establishes that the IRP of the personal guarantor will be heard in the same court as the firm IRP, which is the National Company Law Tribunal (NCLT). This can lead to a quicker resolution and recovery for creditors who lent to the firm based on the personal guarantee. Robust and efficient adjudication infrastructure will be required, on the lines of the Financial Sector Appellate Tribunal that is proposed in the Indian Financial Code. A new regulated profession -- of Insolvency Professionals (IPs) who can be Resolution Professionals and Liquidators -- is required. India has a long history of failure in regulation of professions, as is seen with lawyers, chartered accountants, doctors, etc. The success story here is the regulatory system run by exchanges for brokers. These ideas need to be brought into making the insolvency profession work. Delays destroy value, and disputes about facts in India can drag on for years. A new industry of `information utilities' (IUs) is required who will control trusted data, pertinent to the operation of the IRP as well as used during Liquidation. This would draw on the success that India has had with the working of the securities markets depositories. A regulator is required, to perform (a) The legislative function of drafting regulations which embed details about the working of the IRP; (b) Legislative, executive and quasi-judicial functions for the regulated industries of information utilities and the insolvency profession; and (c) Statistical system functions. The BLRC process had four sound features. 1. Systemic reform. BLRC embarked on a systemic reform. It did not incrementally modify existing laws such as the Companies Act, 2013, or SARFAESI. 2. Using local domain knowledge. The project was staffed with people who were grounded in knowledge of India. While international experience was fully utilised, it was not mechanically transplanted. As an example, the BLRC was aware of the US `debtor in possession' mechanism, and consciously chose to not use it based on wisdom about how this would work under Indian conditions. These decisions were made based on local knowledge about how alternative institutional arrangements would work in India. 3. Innovation. The BLRC was not merely imitative. The proposals were novel in many respects, with a focus on solving problems rather than reshuffling a fixed menu of possibilities. One example of this is the concept of a regulator that writes subordinate legislation in order to obtain malleability in the design of the bankruptcy process, which is not found in the bankruptcy process elsewhere in the world. Another example is the rearranging of incentives for rapid and rational thinking during the IRP, in recognition of the difficulties of banks in India. The conventional Indian solution for information utilities would have been a government-run monopoly like MCA21. Instead, the BLRC envisaged a private competitive industry of IUs. The conventional Indian solution for regulated professionals would have been a monopolistic association, similar to ICAI, ICSI, MCI, BCI. Instead, the BLRC visualised a private competitive industry of self regulatory organisations, the IPAs, who would oversee IPs. 4. Capacity building. The journey to the BLRC report and draft law has created new knowledge (web site) and a community which has expertise on this subject. This opens the possibility of sustained progress on India's journey to bankruptcy reform, with a local community of expertise, who are committed to work on the reform over a sustained period. Our reading of the law reveals seven areas of concern. The law is silent on what denotes evidence of default, which was proposed by the BLRC to be a record in an IU. The law requires a financial creditor who has triggered an IRP to furnish a record of the default from an IU or such other record or evidence of default as may be specified by the Regulator. Similarly, the law requires an interim RP to collect claims. However, it does not specify the kind of proof that a claimant needs to submit to the interim RP. Both these provisions negate the incentive to file financial information in an IU, especially where the law is generally silent on what kind of firms need to file financial information in IUs mandatorily. Section 30(2)(c) says the resolution plan must provide for the management of the affairs of the Corporate debtor after approval of the resolution plan. This imposes uncertainty on how the resolution plan can be assessed, which in turn, increases the possibility of higher judicial intervention. The numerical values included in the law for many time limits could give cause for the adjudicator to permit an extension on the time to decide on a resolution plan. This raises concerns about the extent to which the core objective of bankruptcy reform -- speed -- would be achieved. 2. The working of the regulator. India has ample experience with bad performance of regulators. One important source of these persistent failures is the faulty legal foundations that define the working of regulators. Other countries solve this problem by having a general legal framework for the working of regulators (as in the case of the U.S., but absent in India) or in the laws that establish regulators (which is present in IFC but missing in the IBC). While the report submitted by the JPC reiterates the criticality of role of the regulator, a sound chapter in the law that establishes the regulator is absent. Particularly worrisome are elements such as S.226 which gives the power to the government to reconstitute and supercede the Board, which hampers regulatory independence. IUs are supposed to be a private competitive market. However, the law has failed to incorporate insights about the competitive market within which IUs were intended to operate. There was to be only one price, for data submission, and multiple IUs would compete in offering lower prices to those who submit mandatory information. The draft bill now has the concept of a one-time registration fee. It is not clear how IUs will have a revenue stream and effective mechanisms for competition. Provisions on authenticity and repudiability of IU records as evidence of claims and default have not been introduced into the draft bill. Provisions for data privacy are lacking. 4. Insolvency profession Provisions governing the legislative, executive and quasi-judicial functions of the IPAs ought to have been as detailed and complex as provisions governing the creation of exchanges and other such financial market infrastructure institutions as in the IFC. This is missing in the law. 5. Forbearance. At several places in the law, there are exemptions in the process that can be granted by the Central Government. This is a matter of grave concern. As an example, forbearance in banking regulation gave us the banking crisis today. During the IRP, the Central Government can exempt transactions from the moratorium, in consultation with any financial sector regulator (Section 14(3)). Likewise during liquidation, while no suit can be instituted against the corporate debtor once a liquidation order is passed, the Central Government can exempt legal proceedings from this provision, again in consultation with any financial sector regulator (Section 33(6)). These provisions are dangerous. 6. Judicial infrastructure. The law does not set in motion a world class tribunal. By being silent on this issue, the draft bill ran the risk of delays and transactions costs associated with courts and tribunals in India today. A bankruptcy process that works in the unit of days is alien to today's courts that work in the unit of months. 7. Transition issues. Full care on repeals is required. Some of these are repeals of primary laws, and some are incompatibilities with subordinate legislation. However, these are absent in the law. That Parliament has passed the law is a major step forward. However, in and of itself, this does not yield success in the sense of getting to the desired economic outcomes. While some elements of the process that led up to this law were well done, in many respects, there were shortcomings compared with the 11 principles of sound process design for drafting of laws. The IBC, 2016, is an important milestone, an important way station in the long journey of Indian bankruptcy reform. But it does not, in and of itself, deliver an improved bankruptcy process for India. Now, seven areas of work are required. The first area of concern is a thorough review of the law. This is a law that is going to be actively litigated. Defaulters of the future are not going to cede power to the Creditors Committee without a fight. Expert input should be sought now, on anticipating these problems, and strengthening the draft. This will require an understanding of not just the law, but all the points in the process which interacts with other laws of the land. The alternative way to fixing the law will be to run through cases that are lost in the Supreme Court over the next five years. For example, in the case of the Companies Act, 2013, many years elapsed between enacting the law and starting to solve the problems of a poorly drafted law. If such delays can be avoided with the IBC, this would improve matters. The law embeds large areas for subordinated legislation, both rules (by the government) and regulations (by the regulator). Even when the law is faulty, it is possible to rescue things by good quality drafting of this subordinated legislation. Whether this possibility materialises depends on the choice of team, and the regulation-making process that is employed. The second key concern is the four pillars of institutional infrastructure. Enacting a law does not induce the requisite State capacity. The regulator has to be built. The DRTs have to be upgraded and the NCLT has yet to be set up. An engagement with the private sector is required in bringing forth the first wave of firms who will be information utilities (IUs) and insolvency profession agencies (IPAs). Without these four pillars of institutional infrastructure, the law is infructuous. A well drafted IBC would have created better incentives for the sound working of the four pillars of institutional infrastructure. Given the flaws in the IBC, this task has become harder. An even higher quality effort is now required, to achieve sound institutions. In parallel, the law requires many modifications as an integral part of this process of institution building. For example, there are proposals today to improve adjudication infrastructure through the use of information technology. In and of itself, this will not deliver the desired results. Just as in education, it is necessary to have school buildings, but this is not a sufficient condition. The problem is much more complex, it is about establishing sound processes for the judiciary. The mere presence of a computer terminal in every court room will not deliver the outcomes desired here: to ensure that an IRP can be admitted within the day of the application, or that a creditors' committee can be finalised within a fortnight that the IRP starts. A `Task Forces' process was used to implement institutional infrastructure for the FSLRC report. MOF initiated `Task Forces' with a group of subject experts to plan and oversee the implementation. A similar approach needs to be adopted by the implementing ministry for the IBC to create the four pillars of institutional infrastructure. The last one year of the old regime and the first one year of the new regime are going to require particularly careful planning and handover. For example, the RDDBFI Act needs to be amended in order to have the DRTs serve as the adjudication infrastructure for individual cases under IBC. At present, amendments have been proposed to both the RDDBFI Act as well as the SARFAESI Act, been tabled in the Lok Sabha and referred to the same JPC as IBC. The legislative process here should be taken as an opportunity to align these laws to suit the purpose of bankruptcy reform. The BLRC process, and the law enacted by Parliament, are major milestones in India's economic reform. However, they are the beginning of the journey to bankruptcy reform and not the destination. What would constitute tangible proof of success in Indian bankruptcy reform? Two events and four key data series define the report card for this. Event 1. When a default of a Rs.10 billion firm takes place, it swiftly goes into the bankruptcy process, which leads to a transaction where the firm is sold as a going concern to a new strategic buyer or a private equity fund, and a good recovery rate is obtained by the lenders. Event 2. When a default by a Rs.10 billion firm takes place, the firm gets smoothly put into liquidation within a short time, and a good recovery rate is obtained by the lenders. The share of borrowing from the financial system in the total debt of firms. The share of non-bank borrowing in borrowing from the financial system. The share of unsecured borrowing in total debt. On all four metrics, things in India have become worse over the 1990-2013 period. Everyone is keen on the outcome: the six dimensions of success articulated above. A strong team, with focus and competence, is needed to work on these issues, and this could yield success in a few years. Ajay Shah is a researcher at the National Institute for Public Finance and Policy, New Delhi. Susan Thomas is a researcher at the Indira Gandhi Institute for Development Research, Bombay. The authors thank Anjali Sharma, Bhargavi Zhaveri, Pratik Datta, Rajeswari Sengupta, Renuka Sane, Richa Roy, Shreya Garg, Shubho Roy and participants in a seminar at JSA for improvements to this article. The Insolvency and Bankruptcy Code passed by the Lok Sabha last week envisages Debt Recovery Tribunals (DRTs) as the adjudicating authority for individuals and partnership firms. When originally set up, DRTs were expected to resolve cases within a limit of 180 days. But experience tells us that judicial delay is as much of a problem in the DRTs as with other courts. There is a great uproar about judicial delays in India today. We are now a country where it is widely felt that we know how to run elections but we don't know how to run courts. A commonly touted solution is to hire more judges. However, if the institutional arrangements in which judges operate is faulty, adding more judges is not likely to help. In fact, little is known about why delays occur. The present approach of collecting information about judicial delays concentrates on a few macro-level statistics of pendency and disposal rates. There is very limited information or research that uses micro data about the time taken for judicial proceedings, and the reasons for the delay. In this article, we bring a novel research strategy to bear on understanding the issue of judicial delays. While this strategy is general, we apply it to Debt Recovery Tribunals (DRTs), and present our findings. Debt Recovery Tribunals (DRTs) are statutory bodies established under the Recovery of Debts Due to Banks and Financial Institutions Act, 1993. They were created because the existing mechanisms of debt recovery were ineffective. DRTs were expected to enable the "expeditious adjudication and recovery of debts" within one hundred and eighty days of filing the case. Subsequently, DRTs have also been tasked with enforcing some provisions of the Securitisation and Reconstruction of Financial Assets and Enforcement of Security Interest Act (SARFAESI), and of the Insolvency and Bankruptcy Code, 2015. DRTs have not been successful in realising the objective of efficient disposal of debt-related disputes. We knew, at the time of the creation of DRTs, that the previous debt-resolution mechanisms were slow and ineffective. The DRTs were meant to be an antidote to this problem. But now, more than 20 years after DRTs were set up, we know (Committee on Financial Reforms, 2009) that the DRTs have not been any faster than other courts in resolving issues. If DRTs suffer from long delays, they will not be able to fulfil the new Insolvency and Bankruptcy Code-related responsibilities placed on them. So how can DRTs work better and faster? An answer to this question depends upon the answers to many other questions: Who causes delays at DRTs? What is the immediate cause of these delays, and what is their root cause? What is the role of the tribunal in enabling delays? And importantly, what are the incentives of the different stakeholders that lead to delays? Answering these questions is key to designing and implementing reforms to make our courts work better. We hand-constructed micro data for a sample of cases disposed by the Debt Recovery Tribunal (DRT) in Delhi. We obtained complete information for 22 cases disposed between February and April 2014. The earliest of these cases had been instituted in 2006, and the last in 2013. We captured information about who filed the case, against whom, and the key issue at stake. At the end of each hearing, an order is passed. We analysed each hearing and each order. This yielded observations of 474 orders over these 22 cases, an average of 21.5 orders per case. We captured data about the date of the order, the content of the order and the date of the next order. If there was an adjournment, we noted who asked for it and why. The data files have been released here. When a hearing resulted in an avoidable and unpenalised adjournment, we classified it as a failure. Most often, these adjournments were requested by one of the parties, but sometimes they are caused by the tribunal itself. On average, each failure adds about a month of delay to the case. How much of this was necessary? In other words, if the system had functioned well, how much delay could have been avoided? It turns out that of these 474 hearings, 279 hearings (about 60%) were failures. These failures induced half the delay. Can we envision a world where trial failures are eliminated? At first blush, it seems that we could reduce the duration of the average case by roughly half if we are able to eliminate trial failures. The full gain is, however, larger than this. If there were fewer trial failures, cases would finish sooner, freeing up slots on the judicial dockets. This would let other cases have more frequent hearings. So the delay would drop by more than half if these failures were avoided. 5 Who causes delays: borrower or lender? At DRTs, there are broadly two kinds of cases: those filed by the lender, and those filed by the borrower. The cases filed by borrowers typically ask the tribunal to stop action taken by the lenders under SARFAESI. In these cases, one would expect that the borrowers would have an incentive to delay: they already have use of the money, and they would like to repay as late as possible. This is indeed what's seen in the data. For the cases filed by borrowers, adjournments due to the borrower account for 46% of the total time lost, while about 21% is lost due to the lender, and about 17% due to the tribunal (see Figure 2). In the cases filed by the lender, one would expect that the lender-petitioner would want a quick disposal of the case. After all, it has lent the money, and would presumably like it back as soon as possible. Besides, these lenders are sophisticated institutions that maintain proper documentation and have expensive lawyers in their service. Remarkably enough, in these cases, the petitioner is the major cause of delays. 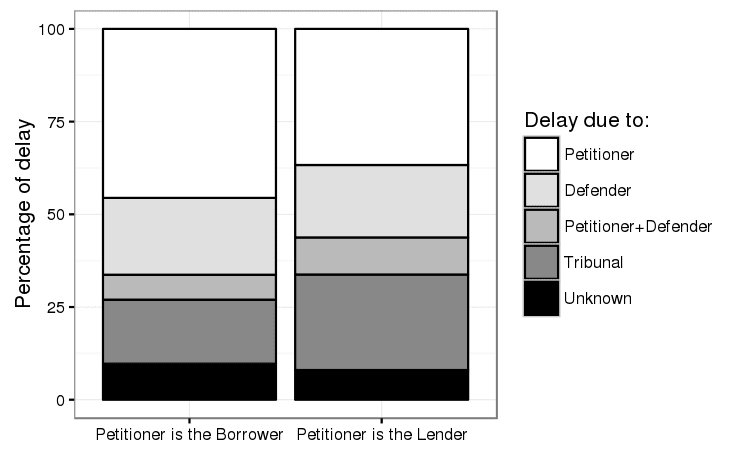 The lender-petitioner accounts for 37% of the delay, compared to 20% caused by the defendant and 26% by the tribunal. Many of these delays are because the lender asks for adjournments while it locates and files documents. This clearly violates our expectation that the lender would want his money back quickly. Given that they have good documentation and good quality legal counsel, it is not clear why they would take so long to perform tasks that lie well within their control. This raises several questions. Why do lenders file cases in courts, and then ask for so many adjournments? Is it possible that their objective in filing the case is not to obtain a judicial mandate in their favour, but to exert pressure on the borrower to come to a negotiated settlement? The large number of cases that seem to be settled outside the court-room (about half of the cases we studied) would seem to indicate so. It is likely that the cost of prolonging a legal fight is lower for a financial institution than for most borrowers. Financial institutions have legal departments and lawyers on retainers, while for most small borrowers, the legal system is a source of anxiety and expense. Perhaps banks delay, in the expectation that the borrower would wilt under the pressure and would be willing to come to a negotiated agreement. But if we look at Figure 2, about 70% of the delays are due to the lawyers. The large number of times the lawyers (on both sides) ask for more time to file documents, as well as the many instances where one or the other (often both) lawyers are absent, or both lawyers request adjournments, suggests another possibility: that the lawyers are in no hurry to finish the case. If the incentives of the lawyers are perverse — for instance, if they get paid not on the basis of prompt resolution of the case in favour of their client, but on the basis of the number of hearings — then it is reasonable to expect that they would prefer to have more hearings. An important weak link is the behaviour of the court. Those asking for repeated adjournments are imposing a cost on the judiciary. Judicial time and capacity are scarce public resources, and repeated delays are a waste of these precious resources. In spite of this, we have seen very little evidence of the court imposing penalties on the parties for causing delays. There is emotion about hiring more judges, but not about cracking down on delaying tactics. Another facet of the data is how often the tribunal itself causes delays. 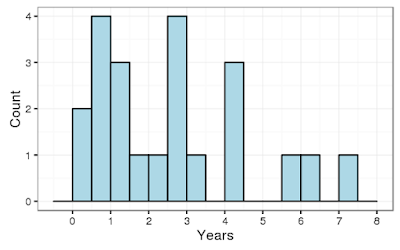 Figure 2 shows that more than a quarter of the time lost is attributable to the court. The reasons are many: the registrar might be on leave, the judge may be attending a conference, or the bar association might have requested a holiday. Most other institutions find ways to ensure that work is not held up due to such reasons. As an example, a railway station or a stock exchange or a bank branch works all the time. To summarise, our study has shown that more than half the time of a case is lost in avoidable and unpenalised adjournments. The parties to the case, the lawyers, and the tribunals, all participate in this delay. The study indicates that lenders may use court delays as a strategy to pressure the borrower to come to a negotiated agreement. Lawyers may have perverse incentives to draw out cases, and tribunals often contribute to delay themselves due to administrative reasons. Laws must provide incentives for litigants, lawyers, and judges to reduce litigation time. For an example, see here on how smart drafting of rules can create incentives to quickly resolve disputes. Poor administrative processes also contribute to delays. Judicial time gets wasted because the administrative functions of a case (like serving notices) have not been completed. The solution to this is better administration, through investment in the court infrastructure, as well as through the separation of administrative and judicial functions of the tribunal. This approach differs from the commonly advocated solution of increasing the number of judges. If the incentives of judges and lawyers do not change, it is unlikely that more judges will reduce delays. In fact, it may be counter-productive: more judges might lead to a greater willingness on their part to grant adjournments. If judges have discretion in admitting cases (as in the Supreme Court), more judges might also mean the admission of more cases, leading to even greater delay. The approach to reforms we have presented here also differs from that of other authors (for instance, Levin 1975, and Posner 1973) in that we focus on administrative inefficiencies as much as on the behaviour of the actors. This is because the business processes around administering justice in our country are primitive. Fixing incentives alone will not solve the problem --- administration needs to be revamped as well. There is a wide consensus in India that courts work badly, and that deep reform is required. Such reform should be grounded in a sophisticated understanding of the value (to a protagonist) and the cost (to society) of judicial delays, and it should be guided by the principles of law, economics, and public administration. The work we have presented above is a step in this direction. Future work will aim to derive rigorous inferences about the causes of delay, the incentives of the various stakeholders, and how these incentives could be modified. Committee on Financial Sector Reforms. A Hundred Small Steps: Report of the Committee on Financial Sector Reforms. Planning Commission, Government of India, 2009. Martin A. Levin. Delay in Five Criminal Courts. The Journal of Legal Studies, Vol. 4, No. 1, pp. 83-131, January 1975. Richard A. Posner. An Economic Approach to Legal Procedure and Judicial Administration. Journal of Legal Studies, 399--458, 1973. Shubho Roy. Reducing delays in litigation by reshaping the incentives of litigants. Ajay Shah's Blog, January 8, 2016. Pratik Datta and Ajay Shah. How to make courts work? Ajay Shah's Blog, February 22, 2015. Pratik Datta. Transforming the operational efficiency of tribunals and courts. Ajay Shah's Blog, February 8, 2016. Prasanth Regy and Shubho Roy are researchers at the National Institute of Public Finance and Policy. Renuka Sane is an academic at the Indian Statistical Institute. We thank Anirudh Burman, Pratik Datta, Kushagra Priyadarshi and Sanhita Sapatnekar for their participation and contributions in the early stages of this research project. Tax policy for a globalised world by Ajay Shah in the Business Standard, 16 May. Special and differential treatment for developing countries reconsidered by Emanuel Ornelas, on voxEU, 14 May. Why the Centre's dubious use of money bills must not go unchallenged by Alok Prasanna Kumar on Scroll.in, 11 May. Also see. Anjali Sharma and Susan Thomas in Mint on the new bankruptcy law, 10 May. Somasekhar Sundaresan in the Business Standard, 10 May, on how to build courts. How India's ridiculous draft mapping data law will impact you (and your business) by Nikhil Pahwa on Medianama, 6 May. Christopher Balding has concerns about the Chinese model, on his blog, 5 May. No one should have to use proprietary software to communicate with their government by Donald Robertson, 4 May. Duolingo is a website that helps you to learn a language, which has 120 million users worldwide. They report 0.87 million users who know Hindi and are using Duolingo to learn English. In their data, a third of Duolingo users in India are using it to learn English. Such tools could make an important difference to percolation of English knowledge in India. 50 years ago: sharp turn left by Ashok Lahiri in the Business Standard, 3 May. Inside the Unregulated Chinese Hospitals That Make Men Impotent by R. W. McMorrow on Vice, 2 May. A key insight about public sector corporations: They should do things that private firms do not do, they should not compete with private firms. Example: A story on the BBC in the Guardian, 1 May. Eric Snowden debates with Fareed Zakaria on CNN, 1 May. The magic of cities: Chess in St. Louis (Chales Bethea in the New Yorker magazine, 28 April), Science and engineering in Huntsville, Alabama (Shaila Dewan in the New York Times, 31 December 2007). India follows a version of the `classical system' of dividend taxation, where companies pay corporate tax of up to 34.61% on their income and a dividend distribution tax ( "DDT" ) of 20.47% on distributable post tax profits. In the last week of February, the Finance Bill, 2016 ("Finance Bill" or "Bill") introduced an additional dividend tax ("ADT") over and above these levies. The ADT applies for resident individuals, partnerships and trusts if they receive dividends in excess of Rs.1 million in a year. The rate is 10% calculated on a gross basis. In this article, we examine the ADT and DDT from the wider lens of taxation of corporations and dividend tax policy in India. We start by analysing the economics: the rate applied, arguments for or against the levy and its impact on different categories of actions. We go on to legal analysis: where does the new provision fit within the legal framework, how is it drafted and will the legal form enable the levy to meet its economic objective? My primary argument is that dividend tax policy in India is based on insubstantial economic rationale in how it determines tax rates and is fraught with legislative inconsistencies. We need to think more deeply about the rate and method of taxing corporate profits and dividends, and urgently address the legislative issues with the ADT and DDT, irrespective of whether or not we reevaluate our dividend tax from an economic perspective. What is the appropriate aggregate tax rate for profits earned through a corporate vehicle? How should the rate derived under (a) be split between undistributed corporate profits at the company level, versus distributed corporate profits? What structure should be adopted for application of the rate split derived at under (b), particularly in relation to distributed corporate profits? Let's start with the first two questions. What is the appropriate aggregate tax rate for profits earned through a corporate vehicle? How should the rate derived under (a) be split between undistributed corporate profits at the company level, versus distributed corporate profits? When modern day corporate income tax systems were first introduced, one of their primary objectives was to act as prepayment of personal income taxes due by the shareholders, also referred to as the "gap-filling" function (Bird, 2002). Therefore, when corporate tax was levied, the company was chosen as the taxable unit in order to prevent potentially indefinite deferral by the individual taxable units i.e. the shareholders who existed behind the corporate veil. To put this differently, corporate tax systems were intended to maintain neutrality between individuals investing through a company or directly, by treating both sets of persons similarly. The implications of this were twofold: firstly, profits were intended to be taxable irrespective of whether they were generated individually or through a company. Secondly, the aggregate rate on profits received through a corporate vehicle was intended to approximate the personal slab rate to the extent possible. Table 1 provides a flavour of international experience with corporate and personal rates. This shows that the dividend tax rate is often structured in a manner that adjusts for the difference between the effective corporate tax and personal tax rates, so as to achieve neutrality between an incorporated versus unincorporated structure. Reduced rate of tax: This method applies a lower rate of tax to dividends than the maximum marginal rate applicable to individuals. Japan (personal income tax rate of 5-45% & dividend tax at 20%), China (personal income tax rate of 3-45% & dividend tax at 20% on 50% of dividend income) and South Africa (personal income tax rate of 18-40% & dividend tax at 15%) are examples of countries adopting this system. Imputation system: This method allows shareholders the benefit of corporate taxes paid by the company. Since imputation credit mechanisms are complex to administer, countries apply them either wholly or partly depending on what they find workable. Australia and Canada are examples. Exemption system: Dividends are exempted from personal tax, on the basis that corporate taxes have already been paid. The exemption can either be whole or partial. The Indian dividend tax system is not an exemption system even though it exempts shareholders, because it still imposes a DDT at the company level. True exemption systems, such as the ones followed in Greece and Brazil, allow for an exemption when distributions are made out of post-tax profits. Deduction system: The company's taxable profits are reduced to the extent that distributions are made to shareholders. This option evidently involves timing issues i.e. a reconciliation of the taxable year of the company and the shareholder, which is why it is not as common. Iceland currently follows a version of this system. Full integration: In its most extreme form, an imputation system would disregard the tax form of the company entirely and only levy taxes at a single level (similar to how we tax partnerships, for example). This method, known as the "full integration" approach is understandably not commonly used, due to the differences in characteristics of partnerships and companies. Its application is typically limited to companies with partnership like features, such as US S-Corps or limited liability companies (LLCs). One variant of this is the exempt-exempt-tax system for the treatment of corporate profit and dividends proposed by Kelkar & Shah, 2012. Most of the relief systems described above are in the context of distributions to individuals. Countries typically allow more relief for intercorporate distributions, recognising the cascading effect of the double tax as distributions move up a corporate chain. The reliefs are likely to perform differently in a cross border context. Dividend distributions to non-residents are often subject to a higher withholding tax (as in the case of Russia or the US) while dividends received from offshore sources are sometimes exempt (as in the case of Singapore). Further, there is some discussion around how a classical system may perform better and create fewer distortions in a cross border context as compared to relief based systems. With this backdrop, let's look at the Indian dividend tax system. Unfortunately, there is no clear answer to any of the three questions. Fixing the aggregate tax rate: Until the introduction of the DDT in 1997, our corporate and dividend taxes seem to have been designed in a manner that factored in their connection to personal tax rates. However, since 2000, dividend tax rates have been increased (2000), reduced (2001) and increased (2007) again, with the ADT being the most recent addition. Their autonomous movement suggests a lack of strategy on the aggregate tax rate. Corporate and personal tax rates have remained broadly unchanged at 30% since 1997, with some variations to surcharge/cess and a couple of outlier years such as 2001. Choosing a dividend tax structure : The dividend tax structure should not be seen distinctly from the decision on aggregate rates. Our dividend tax structure followed a coherent policy so long as our aggregate tax rates paid heed to personal tax slabs, although we have tended to emphasise the importance of administrative concerns. We went from an imputation based dividend relief system prior to 1959, to a withholding credit system in 1959, to a reduced rate dividend distribution tax in 1997, each time citing administrative reasons - see the Explanatory Notes to the Finance Act 1959 and the Explanatory Notes to the Finance Act 1997 for details. In comparison, the Explanatory Notes to the Finance Act 2016 justified the levy of an ADT by referring to the vertical inequity of taxing shareholders at 15%, where those with high dividend income would have otherwise been subject to the 30% slab. The notes do not examine the issue in further detail, and the logic leaves us hanging as it does not consider the broader issues relating to corporate tax structure. We now turn to legal issues associated with the structure of the DDT. Since it is a company level transaction tax which exempts shareholders, it does not mesh well with the larger structure of our income tax act and international tax provisions. It results in incompatibility with treaty provisions, denial of foreign tax credit to non-resident shareholders on DDT paid in India and disallowance issues under section 14A of the Income Tax Act. These issues exacerbate the problems created by an ill thought out corporate tax rate (for example, by increasing the preference for debt over equity). Some of these issues have led people to argue that the DDT should be replaced by a dividend withholding tax at the company level. Let's look at the incompatibility with treaty provisions, for instance. At a time when international cooperation on tax matters is taken seriously, the DDT unilaterally overrides the international tax treaties India has committed to, since none of these treaties were written with a company level transaction tax in mind. This is a demonstration of bad faith and may be also considered an abuse of pacta sunt servenda. We should note that Estonia and India are the only two countries amongst the OECD and BRICS countries that apply a dividend distribution tax instead of a traditional form of shareholder taxation. This means that we no longer fall within the purview of most double tax treaties, and have unilaterally taken a bigger piece of the pie. Estonia does not levy a tax on undistributed corporate profits though, unlike India which does. Also instructive, is that South Africa used to have a version of the DDT, known as the secondary tax on companies (STC) which was done away with to align the taxation of dividends in South Africa with the international norm. here, here and here). It may be tempting to pose a counter that, if the dividend tax was paid at the shareholder level, and high income shareholders were asked to pay an aggregate tax higher than personal rates, it would still result in economic double taxation of corporate profits and not "triple taxation". However, this is not a valid counter because the difference in taxable units results in legal anomalies that effectively convert the ADT into a third layer of tax. For example, a shareholder receiving dividends subject to DDT would face disallowance issues under section 14A, while the shareholder paying ADT may not necessarily be, since ADT distributions are not "exempt" under section 10(34). This difference doesn't seem to be grounded in a considered or logical basis. A host of questions remain open. If the DDT was introduced to bring about administrative simplicity, we need to ask whether the benefit still holds with the introduction of the ADT? If not, shouldn't technologies such as e-filing and comprehensive equity ownership records at NSDL/CDSL enable us to shift to a dividend withholding mechanism without significantly adding to administrative complexity? We follow a withholding mechanism for other forms of income such as interest on securities, and there doesn't appear to be a compelling reason why it should not be possible in the context of dividends. As a broader level comment, our tax laws seem to suffer most from myopic drafting, brought about through these piecemeal annual changes that Nani Palkhivala referred to as "precipitous tinkering". Their amendments often ignore the larger conceptual framework of tax policy, creating more confusion than an introduction of a levy should involve. We need to find ways to defend the conceptual integrity of tax policy in each year. M. Govinda Rao & Kavita Rao, "Trends and Issues in Tax Policy and Reforms in India", in Bery, Suman, B. Bosworth and A. Panagariya, (eds.) India Policy Forum 2005-06, Sage Publications, New Delhi, pp.55-121. Vijay Kelkar & Ajay Shah, "Indian social democracy: The resource perspective", NIPFP Working Paper, 2011. I thank Jonathan S. Schwarz for his comments on the UK and South African position, and Sriram Govind for valuable discussions. I also thank the anonymous referee for thought provoking comments. Shreya Rao is a lawyer who lives in Bangalore.